FOR the first time, value has been ascribed to the ability of people to train for new skills or switch industries, thus bringing benefits to employers and economies. A study has estimated that poor talent adaptability is costing Singapore $280 million in lost productivity; globally, the figure is $163 billion. Nevertheless, a study has ranked the Republic joint fourth with the US in a field of 11 countries; both had a "Talent Adaptability Score" of 57. Among the Asia-Pacific countries in the field, Singapore ranked highest. The Netherlands topped the tables with a score of 85, while China, scoring 23, was last among the 11. Australia and India, the other Asia-Pacific countries on the list, came in at sixth and 10th respectively. This is from the study done by professional services network PwC on behalf of online professional network LinkedIn. Talent adaptability is important because adaptable talents who are a good fit for the job make for more efficient, productive markets, and more engaged employees, said the study. In a market where professionals are adaptable, it is easier for employers to seek out the talents they need, narrowing the skills gap. And as it becomes easier to hire talents suited to their jobs, short-term turnover rates fall, as do recruitment costs. The 11 countries in the study were each given a Talent Adaptability Score based on the ability of their labour markets to adapt to evolving demands; the parameters included the willingness of employees to adapt their skills to available opportunities and the ability of employers to find talent with the right skills for their needs. Countries were assessed in five areas for their scores: promotion rate, market vacancy rate, average number of profile positions, average number of employers and the industry switching rate. Evidence from LinkedIn profiles and metrics from PwC Saratoga were used for the assessments. Singapore was ranked first in promotion rates and fourth in the number of profile positions, but was last in the rate of industry switching. In comparison, India was second and China fourth in this area, although they took the bottom two places in the overall talent adaptability rankings. Feon Ang, the regional director for LinkedIn talent solutions in the Asia-Pacific, said: "Countries that are strategic hubs for key industries, such as Singapore, will naturally play a dynamic role in advancing a talent agenda that reflects the future demand and supply of critical skills." It is thus especially important for Singapore to look to improving talent adaptability, especially since poor adaptability places a heavy cost burden on the economy. In addition to the $280 million cost of lost productivity - run up mainly from people's inability to train for new skills or to switch industries - bad talent matching also means a high turnover. 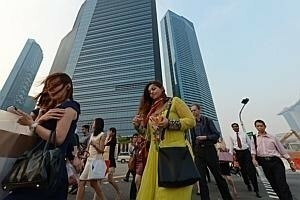 The resignation rate of Singapore employees within their first year in a job is 21 per cent. The costs run-up to hire people to fill these vacated posts - which are avoidable - is $80 million a year. Globally, the figure is $24.8 billion. An overly-specialised economy - one that is not diverse enough - often lies at the root of poor talent adaptability, said the study. Net migration rate, as well as cultural and geographical factors, also seem to be contributing factors. In offering strategies to improve talent adaptability, the study targeted all players in the market - employees, educators, employers and governments. Ms Ang said: "The results of the study underscore the need for everyone involved in the talent ecosystem, including members of the workforce, companies and institutions, to continue stepping up their efforts to nurture and hone skills, so as to create positive economic impact."